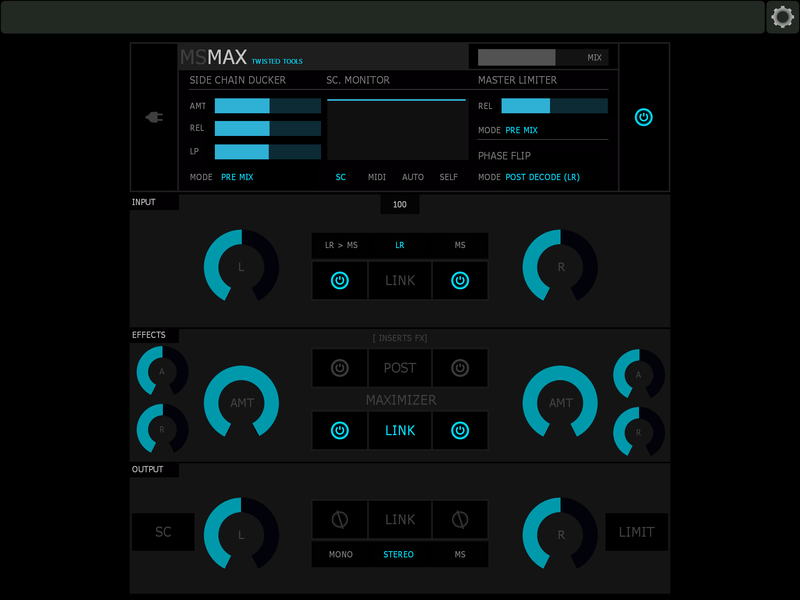 MSMAX is a Maximizer effect and Mid/Side utility built for Native Instruments Reaktor. 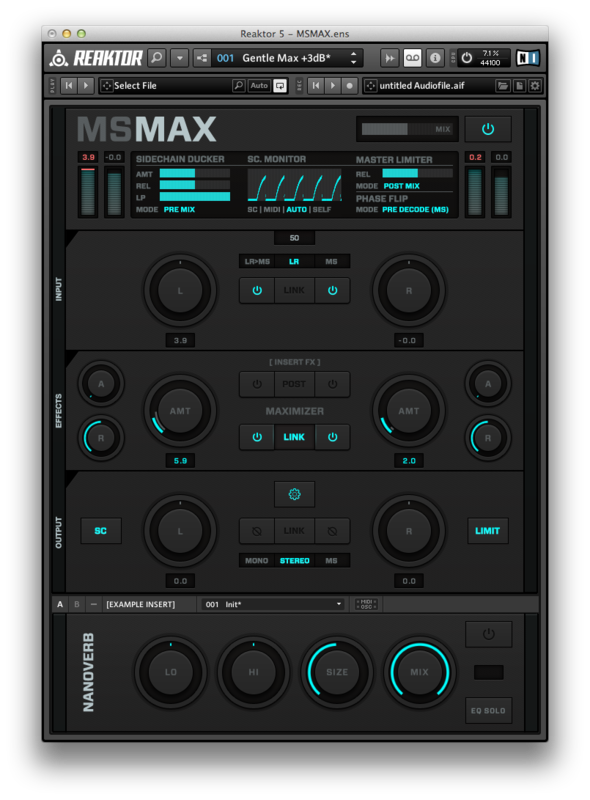 As a Maximizer, MSMAX can be used for anything from subtle to extreme loudness maximization to get individual tracks or mixes sounding loud and finalized. As a Mid/Side maxtrix, MSMAX can be used to encode, decode and process Mid/Side signals to add width or create stereo imaging effects. 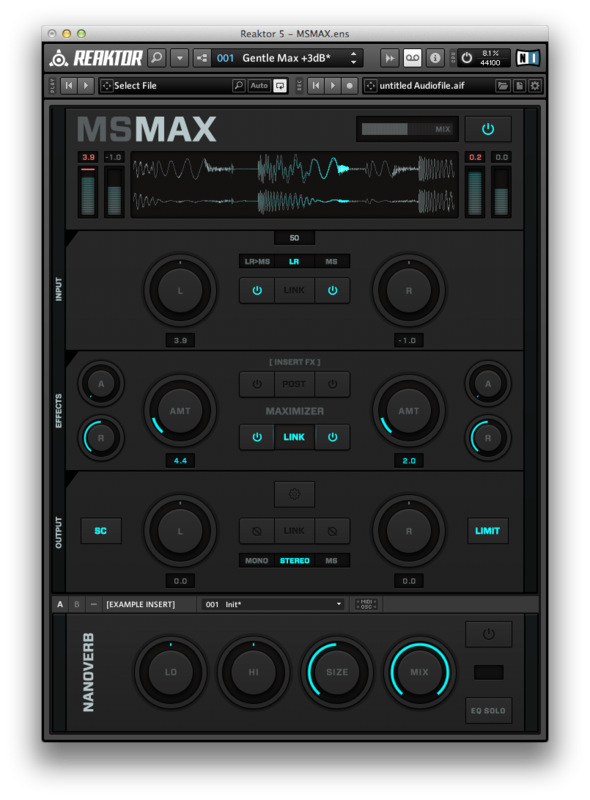 Whether you use MSMAX to slam your drum bus, apply creative M/S techniques within Reaktor or squeeze some more volume out of your master, MSMAX will surely find a place in your Reaktor toolbox! MSMAX is built for Native Instruments Reaktor 5 (Player NOT Supported). 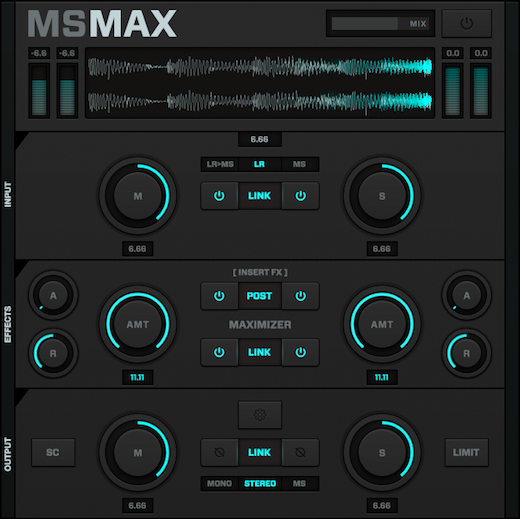 MSMAX is essentially a loudness normalizer that works by limiting the peaks in your signal at 0dB and then raising the volume of the signal below the peaks up towards 0dB as well. Doing so creates a perceived increase in volume or loudness. MSMAX works on stereo, mono or M/S signals at the input and outputs either stereo, mono or M/S signals at the output. In most cases, you’ll use Stereo or LR>MS Input and Stereo Output if you’re using MSMAX to process your stereo bus. The package size for this download approx. 2.3mb zipped, so download should take less than a minute on a standard internet connection.